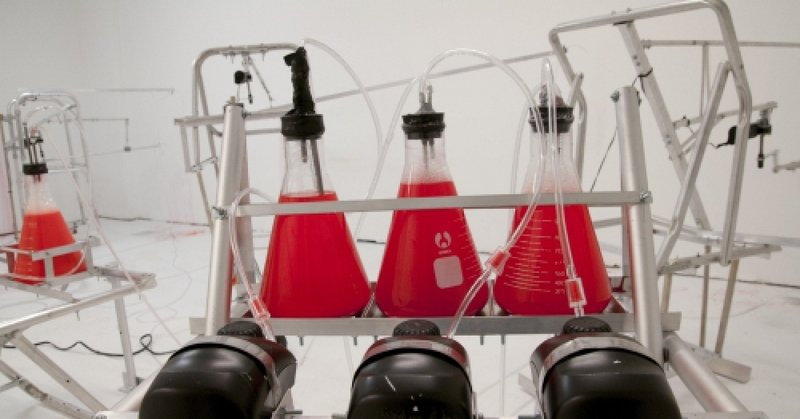 Autohaemorrhaging Actuator is a site-specific, interactive installation that mimics biological/ animal behaviors such as autohaemorrhaging- the action of animals deliberately ejecting blood from the body as a defensive tactic. Autohaemorrhaging Actuator acts as a collaborative project. Triggered by the presence of the viewer, the installation acts to create territorial markings or drawings on the floor and walls of the exhibition space. The more the piece interacts with the viewer, the more the walls of the exhibition space are marked/drawn upon. The installation is comprised of several machines linked together, working in tandem with each other with the viewer. Emphasizing the quality of the hand made object, Porter creates machines that serve as prototypes. Autohaemorrhaging Actuator was created through the fusion of found and custom-made objects. The artist fabricates his machines by re-contextualizing/reverse engineering domestic and industrial objects and joining them with custom elements. His mechanical contraptions mimic humans and animals in both the behavioral and biological sense, exhibiting a reactive and fragile personality supported by circulatory systems cycling electricity and pigmented fluids. Displayed along side Autohaemorrhaging Actuator are Porter’s Preliminary Drawings, which serve as gestural schematic diagrams, illustrating the development of his sculptures. Each Preliminary Drawing is created with graphite, colored pencil, gesso and wintergreen oil transfer on cotton rag paper.